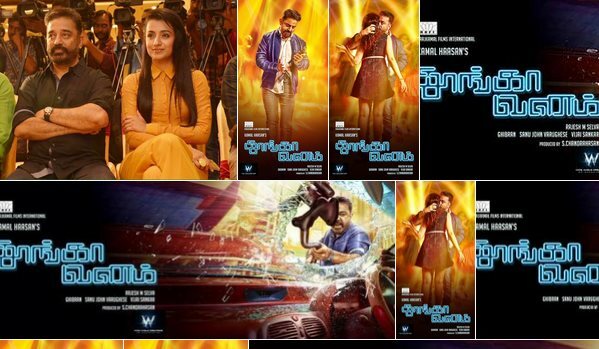 The much-awaited first look poster of Ulaganayagan Kamal Haasan's Thoongavanam is out. The posters were unveiled today in Hyderabad at a press meet held for the film. The film has Trisha playing the female lead and has Prakash Raj and Uma Riaz Khan in crucial roles. The film is directed by Rajesh M Selva and will be made in Telugu as well. The film is said to be an action thriller. In the meantime, the director of the film, posted on his micro-blogging page, "#THOONGAAVANAM, Feeling grateful, Confident & Determined...!!! thanks to all for the wishes.."
The still of Kamal Haasan carrying a knife and a gun has created curiosity among his fans. Fans are raving about Kamal 's look in the film. Ghibran scores the music. The movie is directed by Kamal's associate Rajesh.